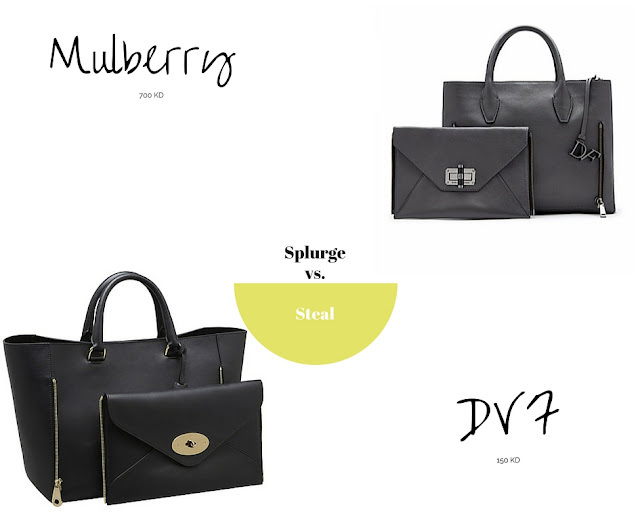 The similarity between Mulberry Willow Tote and DVF latest handbag which is called "Secret Agent" is pretty hard to miss, both feature the same idea it's a clutch, a tote & occasionally a cross bag if you take out the adjustable strap .. I remember blogging about Willow in particular a few years back, I'm guilty of owning one in teal colour, perfect in flight handbag to pop everything as it fits for a book, wallet , a scarf and a bottle of water and all the necessary bits and bobs to carry on a plane.. Plus the fastening zip is where I usually stick in passports for safe keeping ! Would you Splurge or Steal ?